Explain to your counselor the most likely hazards you might encounter while participating in pioneering activities and what you should do to anticipate, help prevent, mitigate, and respond to these hazards. 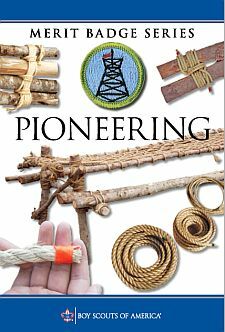 Discuss the prevention of, and first-aid treatment for, injuries and conditions that could occur while working on pioneering projects, including rope splinters, rope burns, cuts, scratches, insect bites and stings, hypothermia, dehydration, heat exhaustion, heatstroke, sunburn, and falls. Demonstrate the basic and West Country methods of whipping a rope. Fuse the ends of a rope. Demonstrate how to tie the following knots: clove hitch, butterfly knot, roundturn with two half hitches, rolling hitch, water knot, carrick bend, sheepshank, and sheet bend. Demonstrate and explain when to use the following lashings: square, diagonal, round, shear, tripod, and floor lashing. Explain why it is useful to be able to throw a rope, then demonstrate how to coil and throw a 40-foot length of 1⁄4- or 3⁄8-inch rope. Explain how to improve your throwing distance by adding weight to the end of your rope. Explain the uses for the back splice, eye splice, and short splice. Using 1⁄4- or 3⁄8-inch three-stranded rope, demonstrate how to form each splice.